In honor of the Skate 3 demo coming out on the 15th I figured it would be fun to spend the next three days covering the game’s various features. So during the course of this weekend you’ll hear all about the singleplayer, multiplayer, and creation/community aspects of the game. So lets start off with a little back story shall we? skate. 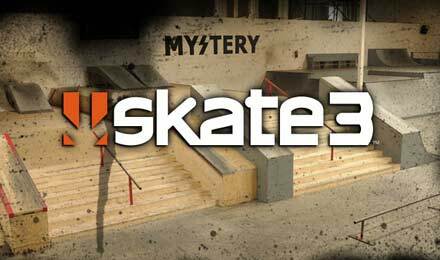 (referred to as OG skate in the community) was developed by EA Black Box and released in September of 2007. A first time venture into the genre, skate. revolutionized skateboarding games with a groundbreaking control scheme. Instead of the tired “push a button – do a trick” method used in games like Tony Hawk Pro Skater, skate’s controls were instead based on using the controller as one would use their body if they were actually skating. The left analog stick controls the players body, allowing him to turn, rotate, and flip; while the right analog let the player control the action of his board and feet, mimicking the actions of the feet in order to manipulate the board into doing flip tricks. This control scheme, while seeming incredibly simple allows for a much more detailed level of control, leading to outstandingly innovative new tricks coming out every day. The singleplayer of Skate 3 is based on taking your skateboarding career to the next level, in OG skate the player took the role of an up and coming skater just getting signed to a team, in skate 2 you were making a comeback after some time in jail. Skate 3 has the player forming his own company and trying to sell 1,000,000 boards. You go about selling the boards by completing challenges, filming, photoshoots, creating skateparks and graphics that other people download, it’s been stated that you don’t even have to play the singleplayer in order to unlock the entire game. Skate 3 takes place in the brand new city of Port Carverton, which is significantly larger than San Vanelona as well as being a skater’s mecca. Instead of being chased away by security guards, they will tell you where to find some of the best spots in town. We’ll have more on this over the course of the next few days.